Leisure Services are about learning from experiences, relaxing and having fun,overcoming barriers and a sense of achievement for the person using the service. Planned activities designed around the needs and interests of one individual at a time. Use local community resources as well as our own buildings and facilities for example our kitchen is a great place to learn to bake. One of a range of services offered by Co-Options. Co-Options provide small-scale services in people’s local communities. This approach works, Co-Options have been doing it for 26 years. Leisure Services are for people who want to have fun whilst learning new things that they enjoy. 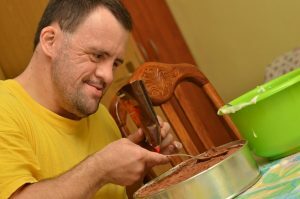 Leisure Services are provided by an experienced staff team and company founded specifically to create services for people with a learning disability.